The photo was taken by our waiter on the ferry from Genoa to Barcelona after an hours-long wait in the sun to board; we were happy to be on our way! Of course, something always goes wrong! This time it was our connection in Frankfurt, originally pretty short at an hour, but made virtually impossible by the delay in Boston in taking off and the fact that the distance within the terminal was literally from one end to the other (estimated to us at 3km, but that couldn’t be - anyway a long way!). 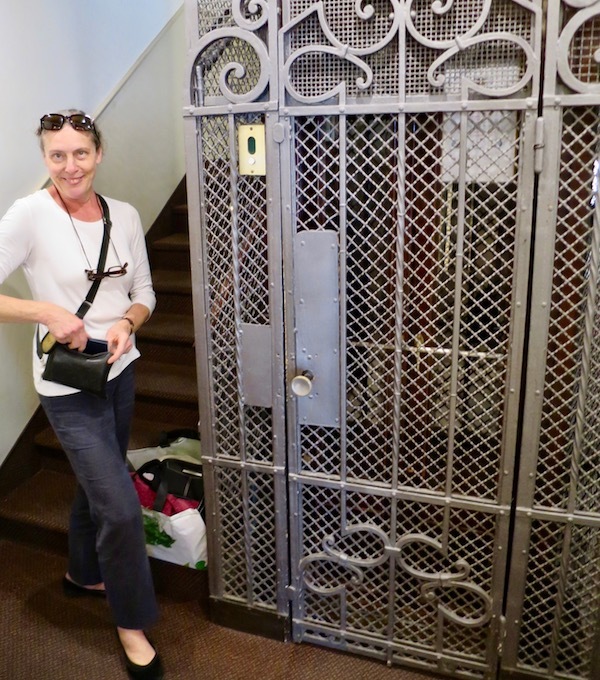 Deb had ordered me a wheelchair so I had a helper who trotted along pushing me with Deb on foot carrying three heavy carry-on bags falling farther and farther behind. When I reached the gate, the agent said “But where’s your wife?”. I turned around and couldn’t see her! In another 90 seconds she appeared and we made to flight to Florence —- but of course our bags did not. I decided early on that since I would be getting a new iMac in December when there’ll be a big upgrade (“iMac Pro”), I’d take my “late 2009” iMac to the villa. Since the original packaging was long gone, it would have to fit in one of the old Samsonite cases we used to use when the weight limit was 70lbs. (We actually used to travel with four of these, per the then-allowance: 280 pounds of summer stuff, much of it foodstuffs like fine baking chocolate which are hard to find in Lucca.) Now of course, we’re down to one bag of 50lbs for each of us, so our “purses” and “carryons” are extremely heavy, making the aforesaid Frankfurt transfer challenging. So we had three hours to wait at the Florence airport until the next flight from Frankfurt arrived. We went most of the way into the city, stopped at a terrific bar, had cappuccino, cold beer, and wonderful gelato. Now that’s the way to make problems disappear! 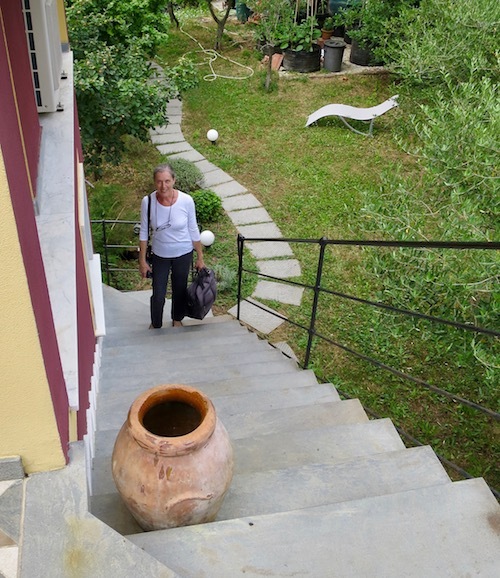 We finally drove up to the villa about 8:30p, were met by Maria-Grazia who said Antonio was not feeling well but that the hot water was waiting for us. Hooray! We unpacked the tables in the living room, got in the shower, and hit the sack. we headed to the Wind store to get new SIMS for our four devices. You’d think this would be straightforward but from previous experience we knew it would not be. Two and a half hours later we had all four devices working and we able to move on to Carrefour to stock the kitchen. We then stopped at the hardware store for new pails, mops, and the like. We swept, vacuumed, and mopped half of the living room. Deb did a once-over-lightly in the kitchen and the three bathrooms. Enough! 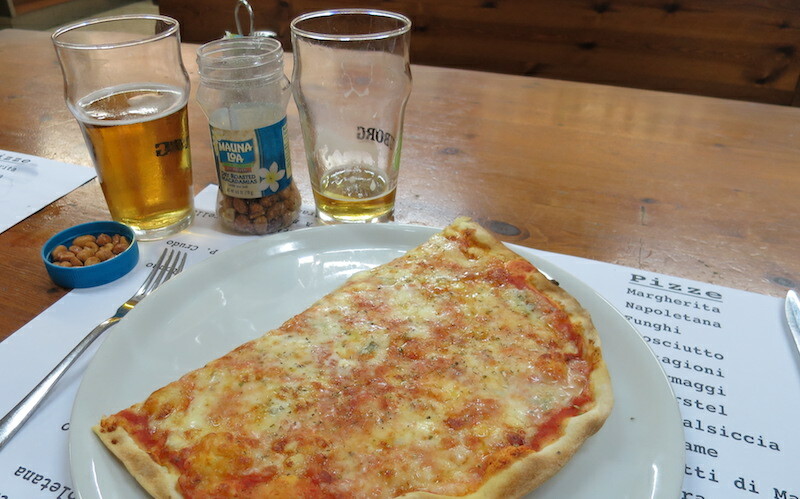 Off to the mediocre local pizzeria for our first quattro formaggi pizza (and lots of beer!). 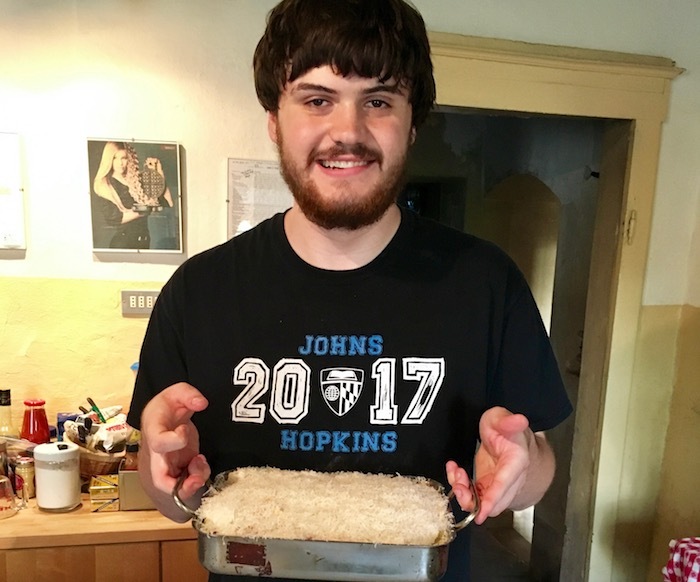 [We blew it with our first report! We went for the pizza on our day of arrival (not straight to bed).] On Wednesday evening we were delighted to have connected with Fede Soldani, an old friend whom Deb met at the KSchool on election night in 2008; he turned out to live 60m down the street. 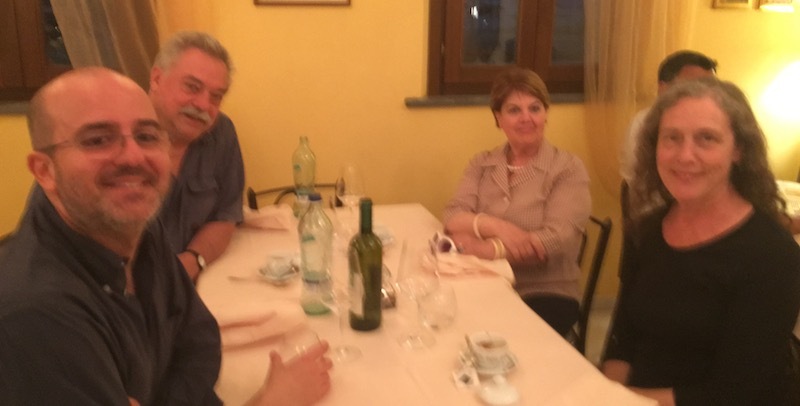 We had a lovely dinner with Fede and his mother (whom we know from attending his wedding) at an acclaimed seafood restaurant on the Pisa harbor. 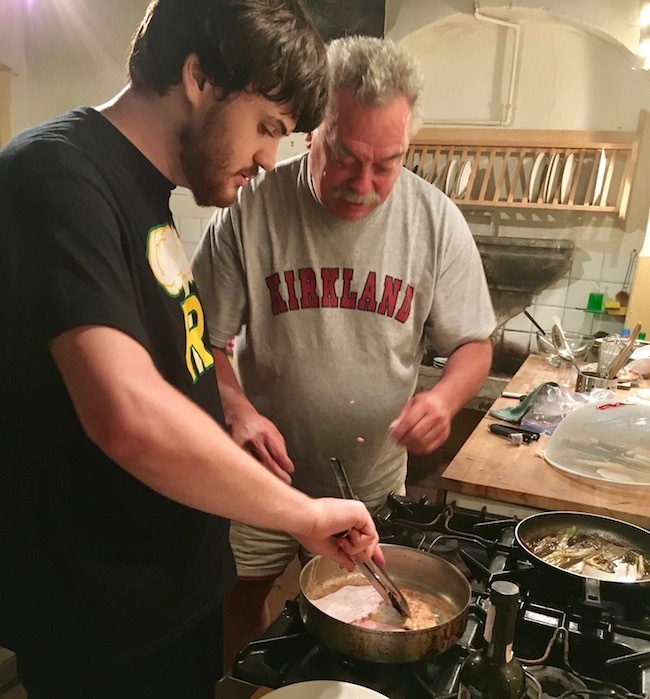 Today, son-in-law Fred and grandson Sam arrived from Philadelphia for a four-day visit. Since there are 25 rooms in the villa, there’s no lack of space; yet only four are furnished: living room, two bedrooms and kitchen. The irony is that the nicest bedroom is also the one in which a major beam cracked during an earthquake two years ago and it’s still held up with a steel pole. So be it. 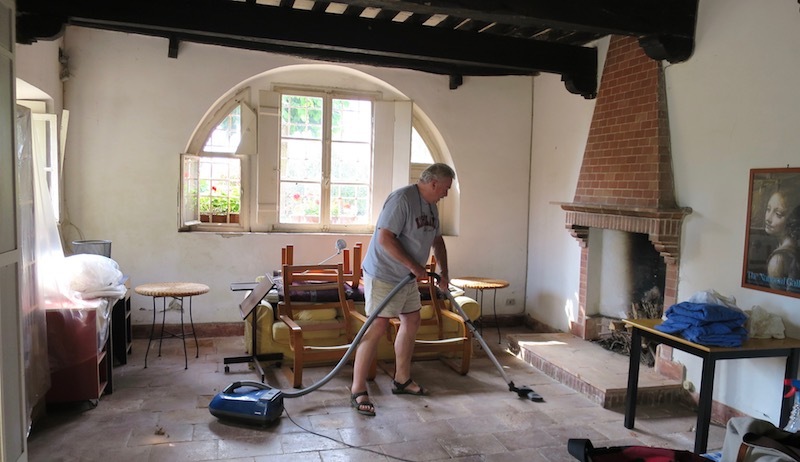 We prepared the room, which had not been used in a decade, during the morning and were ready when Fred and Sam arrived at 1:30p from an uneventful flight via Rome. We all hopped into Fred’s car to pick up the Vespa which was undergoing its annual maintenance checkup and took a quick tour of Lucca highlights: pizza at da Felice (which again this year was well below the previous standard; we’ve scratched it from our list), cappuccini at Casali, and chocolate gelato in front of Puccini’s statue. 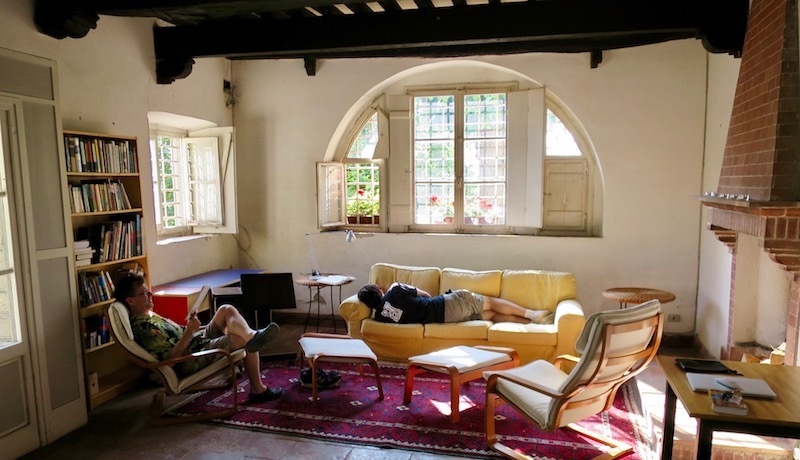 Fred, Sam and Deb went around the corner for the obligatory tour of the Villa Torrigiani of which our villa was a late-comer outbuilding. And we closed the day by all cooking dinner: here veal scallopini which we had with both lemon sauce and marsala sauce along with Deb’s braised leeks. Actually, we closed the day with a five-hour discussion about how to save the world. As usual with Fred. Today was Fred and Sam’s day-trip to Florence and they were gone when we got up. 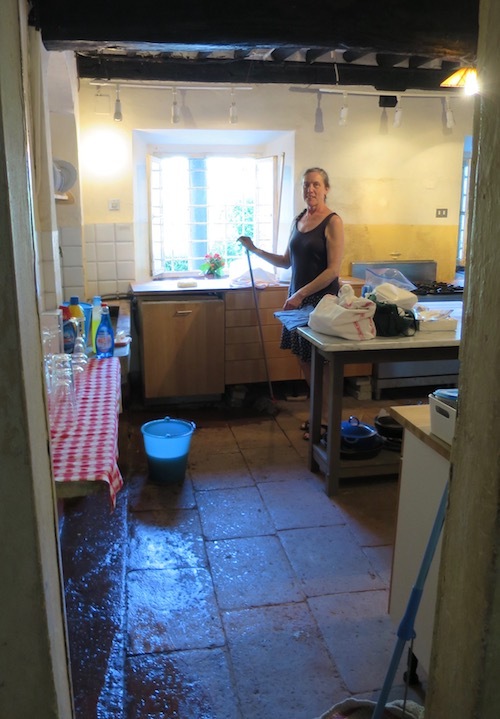 That meant that we could return to our cleaning routine and Deb did a great job on all the important places. All four of us left for Pisa at 8:30a, stopping at Dolcidea for breakfast (except Fred doesn’t eat breakfast!). 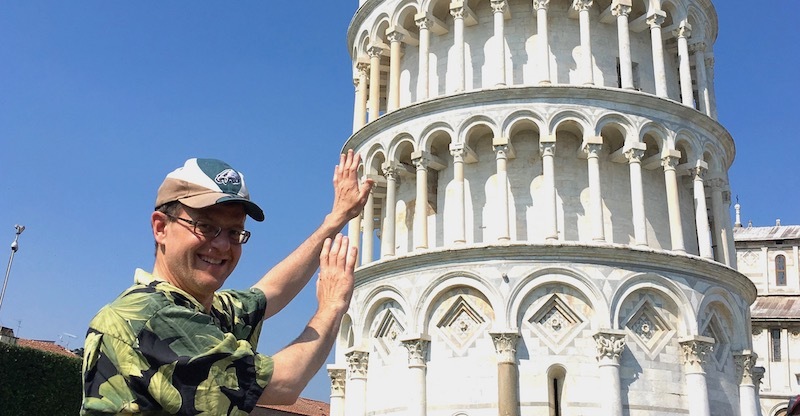 In Pisa we found a good parking spot and the intrepid two went to climb the Leaning Tower; not a big crowd at that hour so it went quickly. Then another excursion to see the duomo and baptistry, which I agonized over joining; my decision to sit and rest was confirmed when they reported that a Mass made it impossible to see the famous pulpit up close. Back in Lucca, we stopped at Carrefour so that Fred could explore the decently broad stock of beers and we could further stock up on heavy things where having a car was useful. Back home, we had a light lunch of salume and ciabatta. and to make the lasagne for dinner. 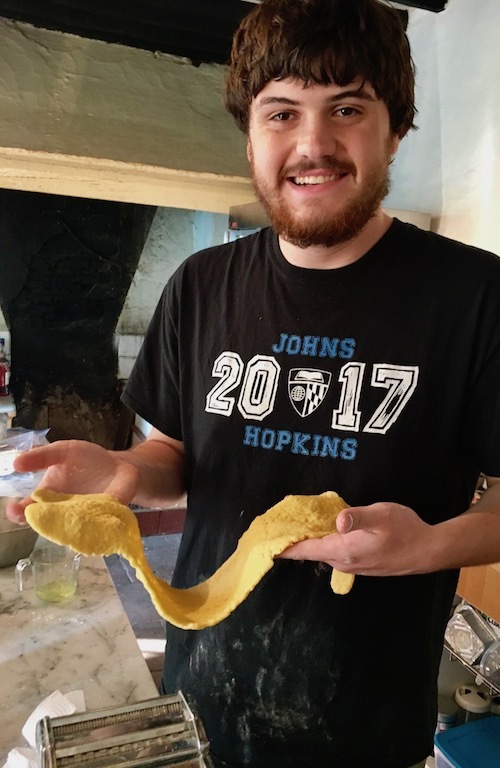 Sam took over the pasta making, Deb produced her fine beschamella, and before long we had a ten-layer lasagne going into the oven. Must be cocktail time, which for this crowd means sampling n kinds of beer in the garden watching the sun set. 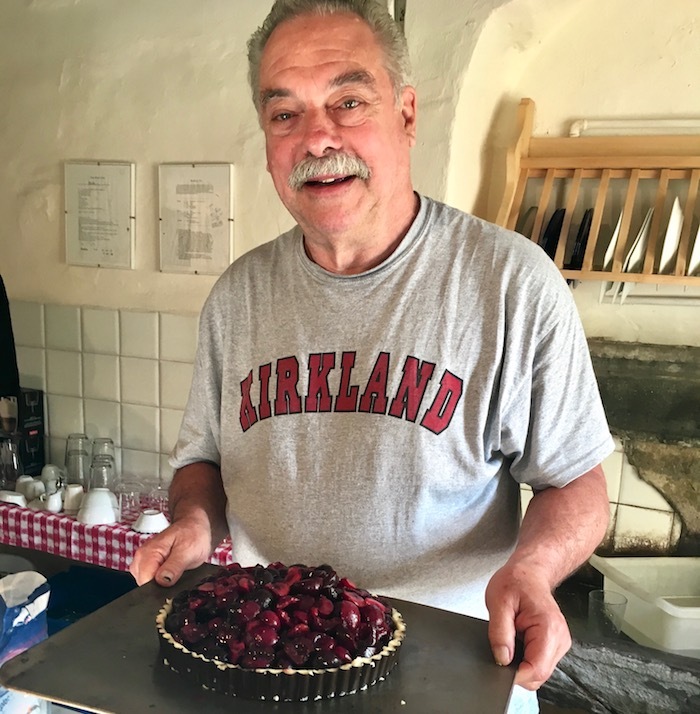 When that occurred, we repaired to the dining room, ate the lasagne (with Sam returning to the kitchen for a second helping), salad, and the first cherry tart of the season (with the finest Vignola cherries; season unfortunately almost over). Then we settled in for another session of solving the problems of the world, this time with a firm deadline of midnight. Father’s Day and Fred took us all out to Buca di Sant’Antonio for the midday meal. 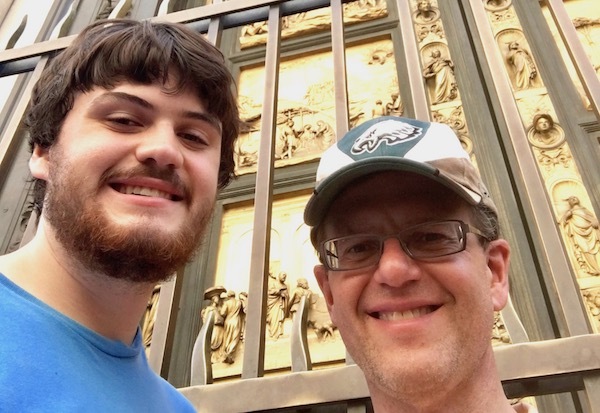 He and Sam headed into Lucca early to walk around the ramparts and reported that it was a terrific experience except for a caravan of 100 Fiat 500s which had been given permission to drive around the embankment in parade-like fashion. We split a tortino di funghi porcini on chickpea pureé which was a terrific version of a sformato, something we’ve been trying to perfect. 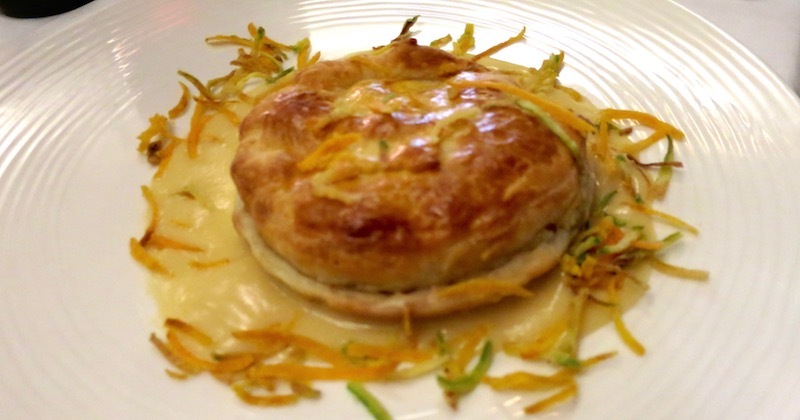 This one was served on puff pastry but many are simply made in a tapered mold and served inverted. 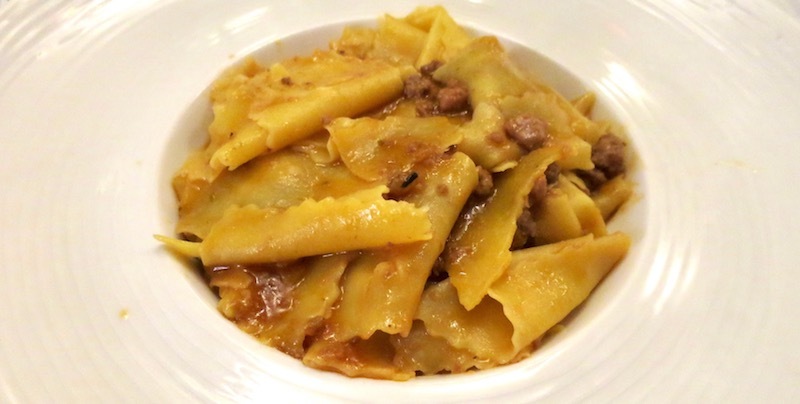 For primi, both Fred and Sam had the Tortelli al Sugo which appeared to us to be the local meat-filled ravioli with meat sauce called “tordelli”, the star of a sagra which F&S declined but which we’ll attend next Saturday before leaving for Genoa. 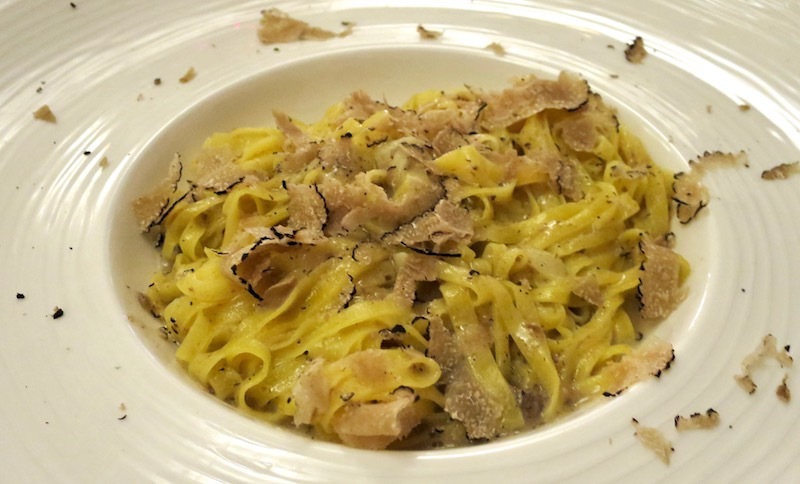 We had the tagliolini with truffles, just excellent. And though Sam declined to sample it, he was willing to smell it! And also the fresh pasta with rabbit sauce, serviceable. We’ve yet to buy and cook a rabbit (for some strange reason since we always intend to). This should motivate us. Deb and I also had some grilled lamb chops; too inviting to remember to take a picture! After lunch F&S went to explore Lucca some more while we went home via Dolcidea to grab a large tub of gelato in six flavors. 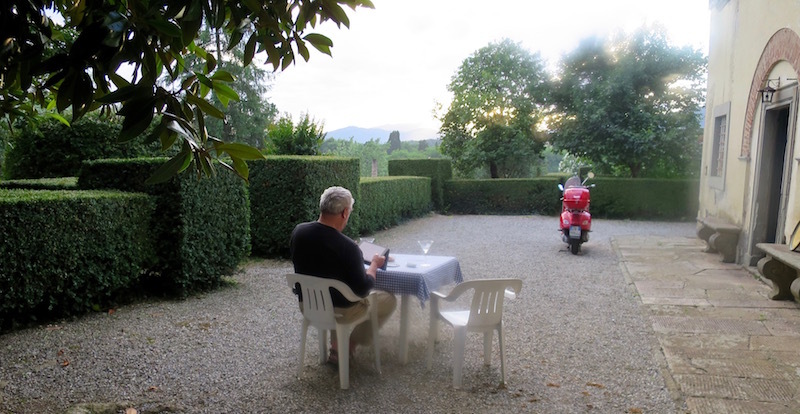 Negronis in the garden, a simple supper of salume and gelato (pistachio was the winner), and more hours of talk about the future of the villa and saving the world. Sunday, July 25, La Sarzana, Liguria. Well, finally the day came and we were off! Here’s a rundown of how we pack: there are five storage spaces. The top-box on the rear holds our large supply of ziplocks, our two laptops cushioned with a bath towel, and a custom-shaped white bag containing our picnic kit and large supply of adapters and chargers. The well under the seat carries our rain gear, our on-the-road necessities like salt, pepper, ketchup, EVOO, and our Ligurian guidebook. Deb wears her backpack but when riding it sits comfortably on the topbox so doesn’t weigh anything; she says that it’s lighter this year than ever (practice, practice!). My backpack sits on the running board; it contains my clothes, CPAP machine, and toiletries. Finally the front bag contains “our” toiletries and my regular shoes. We start out with the odometer at 20,166km after six summers (12,500m, four times from Boston to LA). As we left, the skies were threatening rain but we got to the coast and almost to Pietrasanta before a few drops fell. Two cappuccini later the sky had brightened and we went on. We hoped to stop in Pietrasanta for lunch but the good restaurants were in a pedestrian area where the Vespa could not go and we needed to keep an eye on our luggage while eating. So outside La Spezia we found a reasonably serious restaurant/pizzeria where we had the local mussels (reputedly the area has the best in Italy); nice and plump! It’s stunning to me what a difference six years has made in the ease of traveling as we do. Back then we had to pick a town to stay in, get to the tourist office before it closed to retrieve the list of B&Bs and then make phone calls to find a place. Today it’s booking.com all the way. 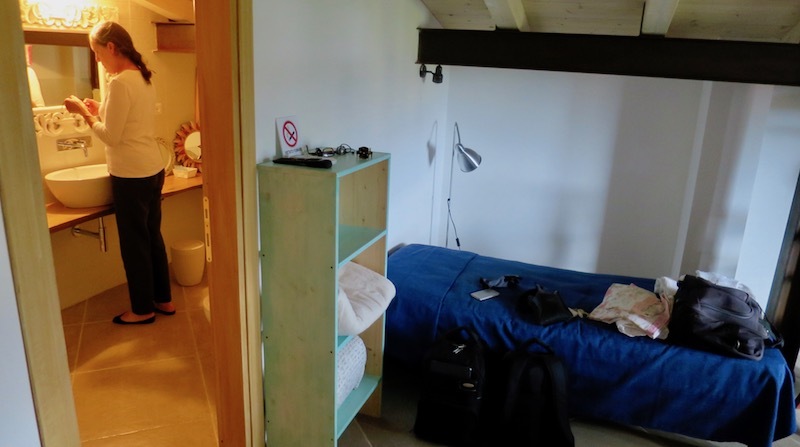 When we decided to spend the night in La Sarzana, we went to the center to try to find the “fancy” hotel (likely to still be in our range) but there was no such thing. With five minutes on booking.com, we saw a dozen places with the advantage of ratings; thirty seconds later we had a booking at a B&B 3km north of town for 65 euros (with breakfast). As is common for such B&Bs, it was all very recent new construction with a super bathroom, air conditioning (ugh), and a “garden view” added onto an existing suburban house as a way to bring in extra income. Delightful hostess. Although the idea was to just put our feet up for a few minutes, we spent the next three hours prone researching the dinner candidates. 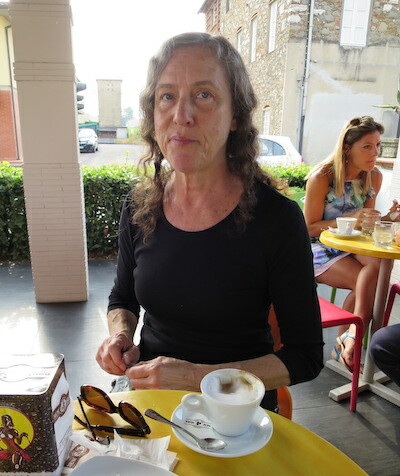 Deb did a terrific job in discovering Locanda Don Pedro, incongruously situated behind a big box store on the Via Aurelia. 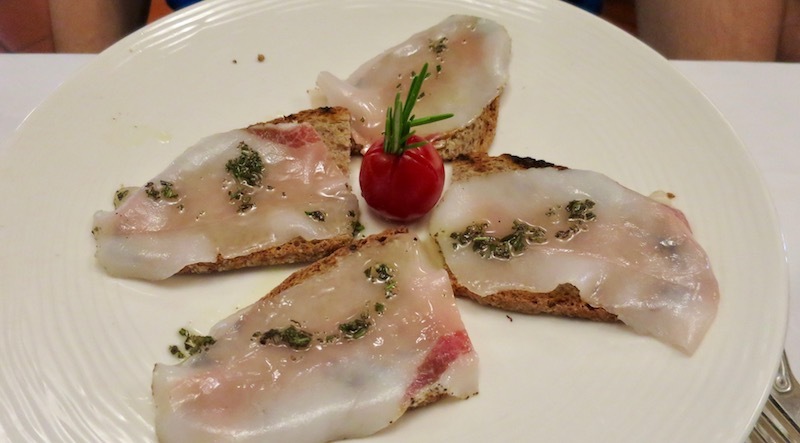 We were stunned at our antipasto, a “mantecato di baccala”, which was everything you could want in dried codfish. 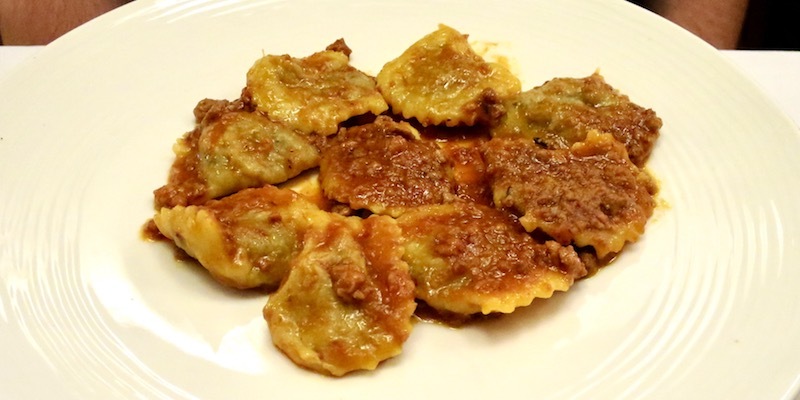 Our first primo was the regional specialty, pansoti, chard-filled ravioli. These were lovely with a fine (and typical) walnut sauce. Deb wanted vongole so we ordered the gnocchetti with clams and mussels. Again, an excellent dish. Our single secondo was not memorable. But the time we spent waiting for our food was. Our included breakfast was more than welcome (although because it was Sunday I couldn’t arrive with my customary purchased grapefruit juice). Well, we’re not used to this (yet). We had a medium-size distance to go today (95km; 60m), about two-thirds of it through the national park containing Cinque Terre with unending sharp turns as the road mounted and fell, and after about an hour we were both hurting in the rear. Happily, there was a small town in the center of that 40m stretch offering just the sort of “workingman’s lunch” we were after. The fusilli Bolognese was unremarkable but Deb’s sformata of string beans was just the sort of thing she’s been admiring for years. We show it here to remind her to make it once we return to the villa. 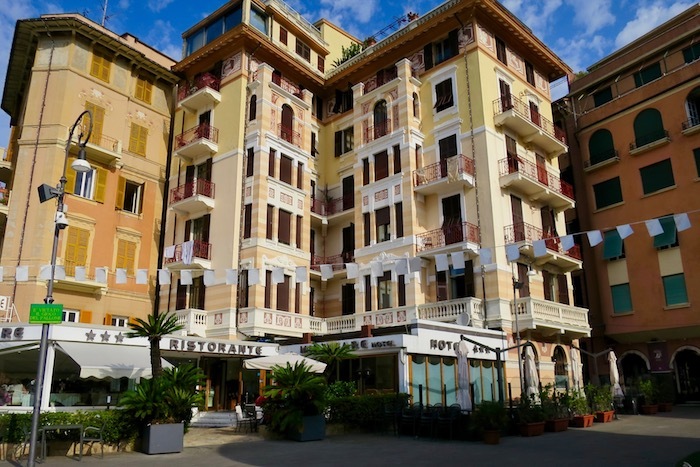 When we arrived in Rapallo we were pleased to see that the three-star hotel Deb had booked was right on the harbor promenade. Unlike yesterday, we could have walked from Rapallo to Recco (11km) so it was a short ride and we lingered over the very good hotel breakfast, including some of the local focaccia which, unlike most, is soft as a pillow and tastes of the Ligurian olive oil with which it’s made. We’re trying to sample as much focaccia in Liguria as possible so when Deb discovered a bakery around the corner from the hotel, she naturally brought back some typical breakfast focaccia with onions. We were very much looking forward to spending enough time in Recco for several meals. We first encountered Recco on the Oldways tour with Fred Plotkin (2004?) 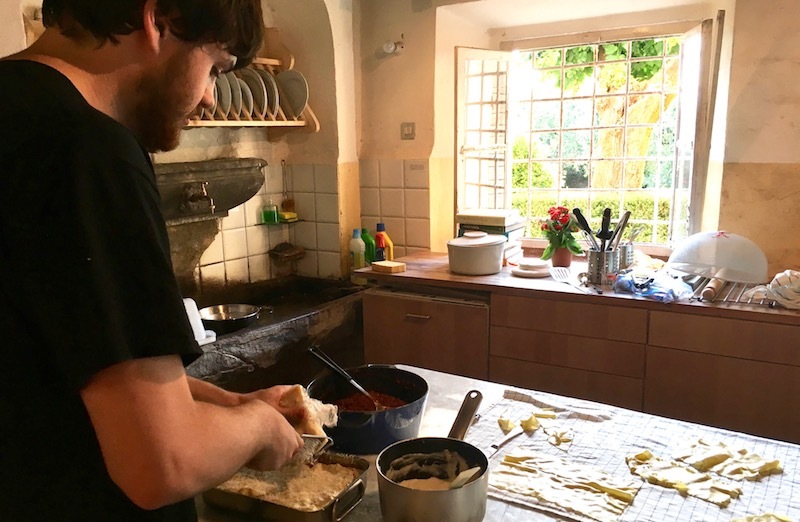 and were very impressed with the local specialty “focaccia col formaggio” (a flaky dough encasing a fresh local cheese) and with the pesto of a freshness and vibrancy we had never experienced. After dropping the bags at our nondescript two-star hotel just outside of town (another Vespa fanatic and his wife as hosts and a fine room with unexpected amenities such as a refrigerator), we went (once more) to our favorite Recco restaurant (of the dozen serious restaurants in this tiny food-destination town, we’ve only tried six or so), Le Vitturin 1860.
and the exploratory dish, fried anchovies. You would never imagine that they were anchovies; the texture was very light and the taste that of sole. Sorry to say that the pesto was a terrific disappointment: not bright green and not at all vibrant. When I explained to the waiter that it was very inferior to what we’d had many times before, he disappeared into the kitchen and returned to say, yes, today the pesto was made in a food processor rather than by hand in a mortar; so sorry, and off the bill it came. Such incidents remind us once again that you can’t step into the same river twice. After a long and lazy afternoon, we took the advice of our host and went 200m down the road to a popular pizza place. The photos we took are acting up so can’t be shown. The linguine with vongole was fine and the focaccia col formaggio variation with onions and gorgonzola was much much better than we’d feared. Another rather easy ride today: 25 miles from Recco to Genova. After yesterday’s disappointment, we planned to have lunch at the premier destination restaurant in Recco, Manuelina, where we hoped to find the pesto of yesteryear. But, when we drove up, it was their weekly closing day and we were forced to return to Viturin. Although the waiter assured us that the pesto was now “OK” he was wrong. And today, instead of trofiette, what the waiter called “lasagne” with pesto. After lunch we returned to the hotel to load up the Vespa and were on the road. 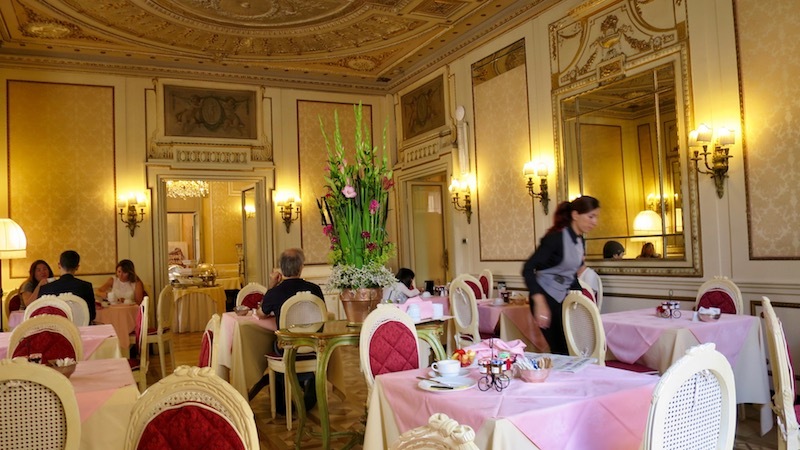 Deb had selected a “more expensive” hotel (150/night) for our three-day stay in Genova and it was a big surprise to pull up to the Hotel Bristol Palace, a four-star half a block from the ducal palace. It has been an unalloyed pleasure and we look forward to luxury we won’t encounter again on this trip. On a ride around town we had our only serious downpour (5 min) which necessitated a stop at a local bar. Thereafter, only sun. 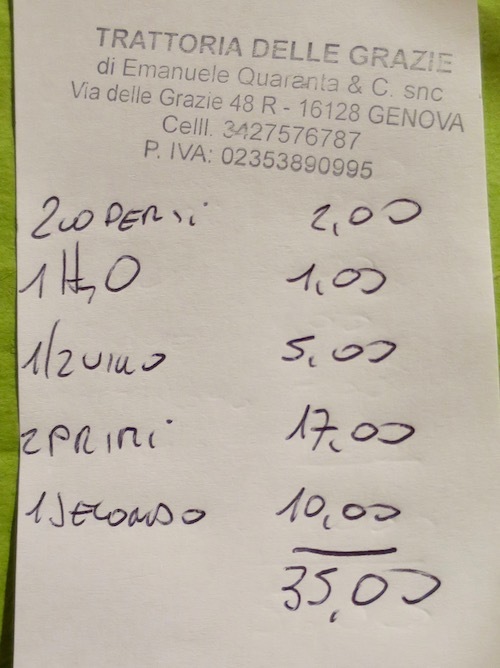 Of course, when in Genova, one had to have more pesto so we were pleased that the menu specified that the basil was from Pra, the nearby town famous for its flavorful basil. Sadly, not made in a mortar but called by the correct local name of mandilli (handkerchiefs). Finally, a really well-done fish ravioli, something I can’t remember ever having. Sorry about all the food. Our pictures of the hotel were not stunning enough to convey the splendor so we’ll have to take some more. we finally wandered a block away to the Palazzo Ducale where there was a fine Modigliani exhibit of 20 or so portraits and a few full length figures. Modigliani was a constantly sick young man who, once in Paris (from 1909 to his death at 36 in 1920), indulged in all the vices that surrounded him. He began as a sculptor in an African primitive style but was so slow that he turned to painting. He turned out some 200 paintings but only in his final year were they beginning to sell. He left a pregnant partner with whom he’d had a daughter; she jumped off a balcony to her death two days later. As usual, the highlight of the day was the restaurant that Deb once again chose wisely, a small and simple one in the medieval section where most diners sat around a U-shaped counter. and the local mandilli with pesto (happily, this was the bright green and lively-tasting version we’d been searching for). We retired realizing that an important deadline was upon us: I placed a classified ad in the New York Review of Books (on the stands today) soliciting an Italophile couple with an interest in sharing a “distressed” Tuscan villa and the website to which they were referred (ruml.com/villa) is only partially complete. Yikes!